Nice Day Coffee - Make every day a nice day! - All Chucked Up! You are Here >> Home >> Health and Fitness >> Nice Day Coffee – Make every day a nice day! Allow me to show you (and briefly explain) all 3 variants of Nice Day Coffee. 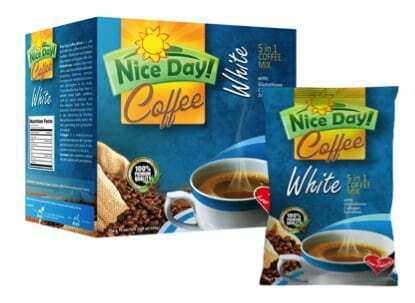 Nice Day Coffee White is a safe and effective coffee mixture that contains Glutathione and Collagen. These two important ingredients help radiate and lighten the skin. Glutathione contains important amino acids that provide antioxidant properties, improves immune function and metabolizes toxins and carcinogens in the body. Incredible right? That means, these benefits may help treat or prevent certain health conditions such as cancer, diabetes, and liver diseases. 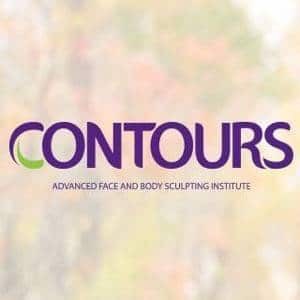 Aside from these functions, Glutathione also helps in skin lightening by blocking the tyrosinase activity within the skin, preventing the production of melanin; Collagen, on the other hand, is a multi-functional protein that improves skin hydration and decreases joint pains. It also sustains hydration in the skin; Sucralose adds sweetness without the extra calories and carbohydrates. 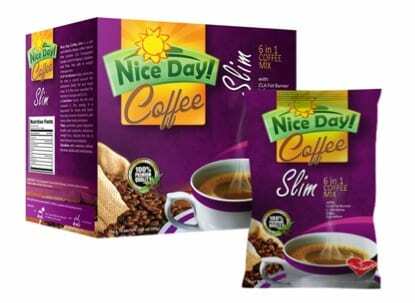 Nice Day Coffee Slim is a safe and effective dietary coffee mixture that contains CLA (Conjugated Linoleic Acid) Fat Burner, L-Carnitine and Fiber that aids in weight management. Here’s how it works… CLA Fat Burner helps shrink the fat that is stored around the abdomen (belly fat) and thigh areas. It is the most awarded fat burner in Europe and U.S.A. We all know how hard it is to lose fat in those areas, right? L-Carnitine, on the other hand, burns the fat and converts it into energy. It also helps improve hearing and brain functions, as well as muscle movement, and many other body processes. Fiber promotes good digestive health, enhances weight loss, reduces the risk of heart disease and diabetes. Likewise, Sucralose adds sweetness without the extra calories and carbohydrates. My wife and I are quite the gym rats and workout regularly. Every little bit helps… that’s the very reason why we always make it a point to have this particular Nice Day Coffee drink as part of our daily ritual. We actually look forward to this because it really tastes amazing, too. 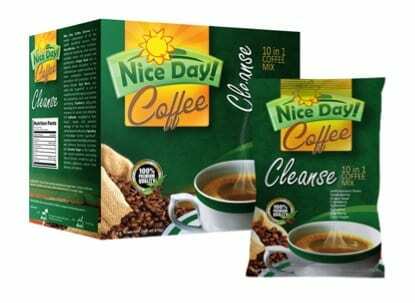 Nice Day Coffee Cleanse is a composition of all the health beneficial sources. I’m not kidding… it’s got quite a handful of incredible ingredients! It has Ganoderma, the most nutritious medicinal mushroom that actively combats cancer cell growth and proliferation. Grape Seed aids in improving blood circulation resulting to lower cholesterol, hypertension prevention and protection of the blood vessels. Goji Berry, also called the “superfruit”, is rich in beneficial nutrients and anti-aging properties also preserving vision and mental well-being. Cranberry safeguards the kidneys from disorders and reduces instances of urinary tract infections (UTI). Sylimarin, recognized as “liver tonics”, repairs and prevents damage of the liver from toxic chemicals and medications. Spirulina, a microalgae turned “superfood”, possesses natural detoxifying functions and immune boosting nutrients. Coconut Sugar as the healthier and natural sweetener preventing risks of chronic conditions such as diabetes, gallstones, cancer, heart diseases and obesity. Whew! That’s a LOT! Amazing, right? Our family has all three variants here at home. Why all three? Because apart from all the health benefits that each respective Nice Day Coffee variant offers, they all taste wonderful. Besides, why drink something that ONLY tastes great when you can enjoy a drink that offers that and a whole lot more? Nice Day Coffee is sure to make every day an awesomely nice one. 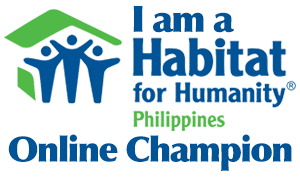 Oh by the way, Nice Day Coffee actually tapped Ellen Adarna to do their “Healthy is Hot” campaign. Ellen happens to be a good friend whom I have bonded with during our time in “Survivor Philippines: Celebrity Doubles Showdown” two years ago. She’s very feisty and really fun to be with. I actually heard that her Nice Day Coffee commercial recently got banned because of how “hot” it was…! There you have it. So, what do you think? Should it really have been banned? Hey, I’ve got an idea… Why don’t you talk it over with friends and see what they think as well. And while you’re at it, enjoy a couple of rounds of delicious and healthy Nice Day Coffee to keep the conversation going. Here’s to good health and Nice Days ahead. Cheers. You can check out Nice Day Coffee’s Official Facebook Page. Follow them on Instagram (@NiceDayCoffee) and Twitter (@NiceDayCoffeePH). ‹ “Sabores de Mexico” at Crimson Hotel Filinvest City › Teddy’s Bigger Burgers – a BIG hit in Manila!